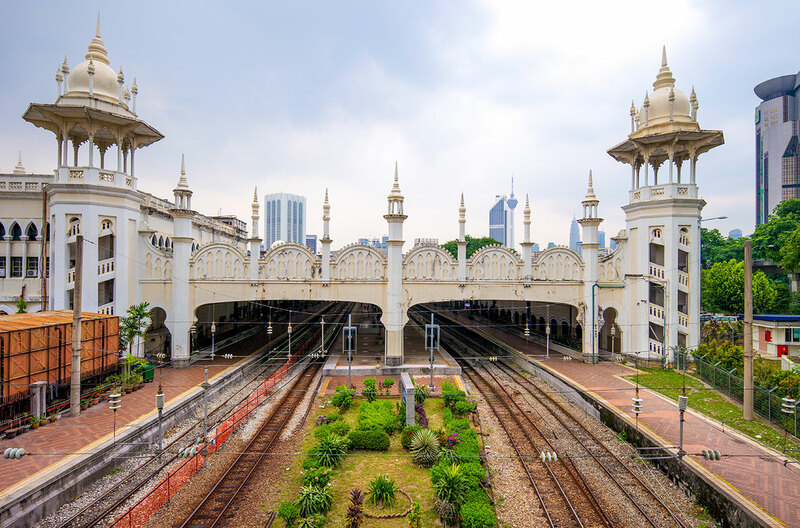 We are pleased to inform that in efforts to increase our coverage of the railway network in Southeast Asia, we are launching online train ticket booking in Malaysia. 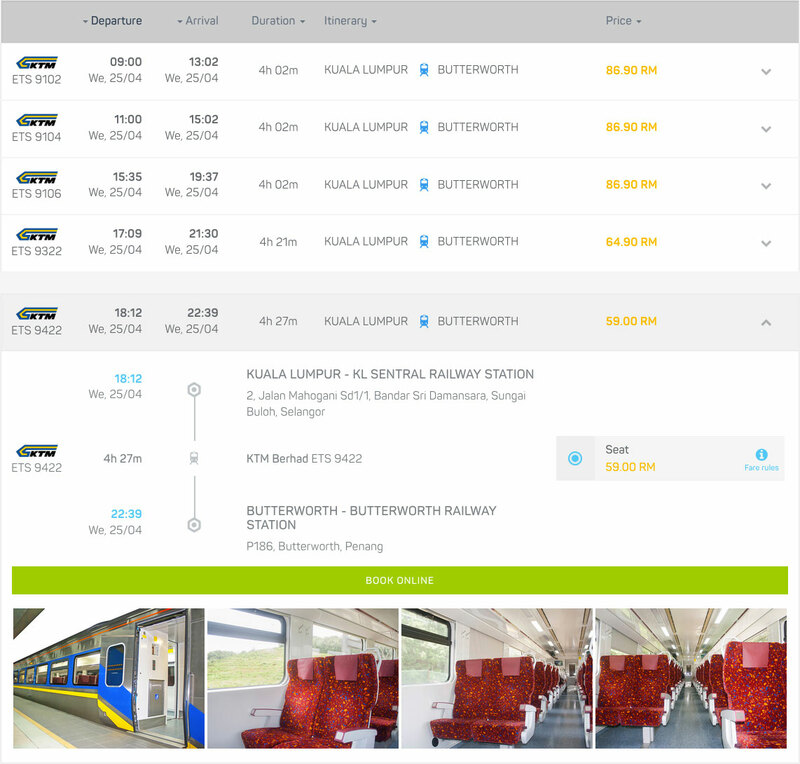 Starting from today, travellers can use Baolau to find timetables and fares for KTM ETS and KTM Intercity services operated by the national railway operator of Malaysia, KTM Berhad. We support advance ticket booking for more than 60 train stations distributed along Peninsular Malaysia, including Johor Bahru, Gemas, Pulau Sebang / Tampin, Kuala Lumpur, Ipoh, Butterworth, Alor Setar and Padang Besar in the West Coast, and Kuala Lipis, Gua Musang, Pasir Mas and Tumpat in the East Coast. KTM ETS, shortform for ‘Electric Train Service’, is a high-speed rail service that operates along the electrified double-tracked stretch of the West Coast Line between Gemas and Padang Besar, the terminus station located on the border between Perlis state in Malaysia and Songkhla province in Thailand. KTM ETS trains travel up to 140 km/h on a metre gauge rail line. ETS trains are classified as Platinum, Gold and Silver services, each train having only one class of seating. ETS Platinum provides the fastest service with minimal stops only at key stations. ETS Gold provides a limited-stop service at major stations. ETS Silver offers an almost all-stop service with the lowest fares. EP92xx Platinum services operate between Kuala Lumpur and Padang Besar. EG94xx Gold services operate between Gemas and Padang Besar. 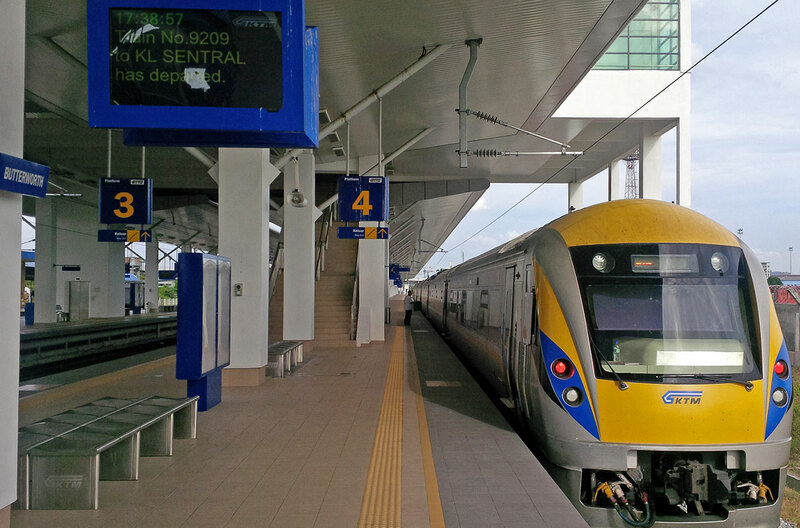 EP91xx Platinum services operate between Kuala Lumpur and Butterworth (Penang). EG93xx Gold services operate between Gemas and Butterworth (Penang). 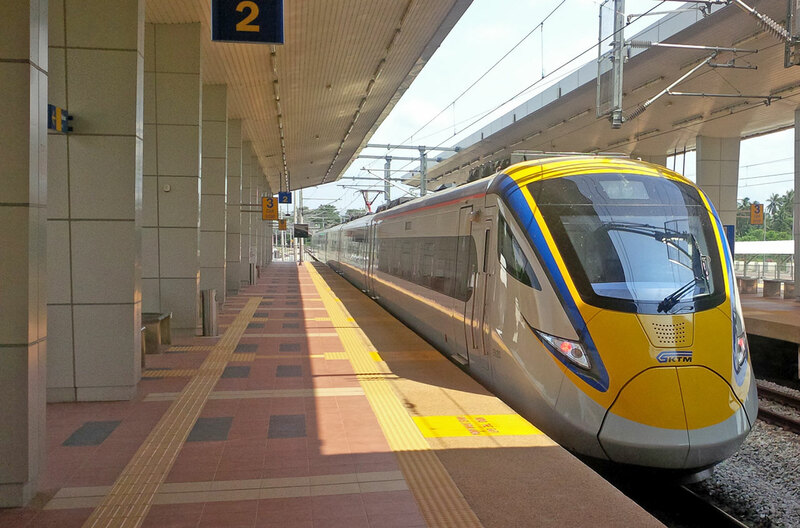 EG90xx Gold, ES90xx Silver services operate between Kuala Lumpur and Ipoh. KTM Intercity is a diesel-hauled rail service than runs on a single-track along the West Coast Line between Pulau Sebang / Tampin and Johor Bahru, and along the East Coast Line between Gemas and Tumpat in Kelantan state, bordering with Narathiwat province in Thailand. 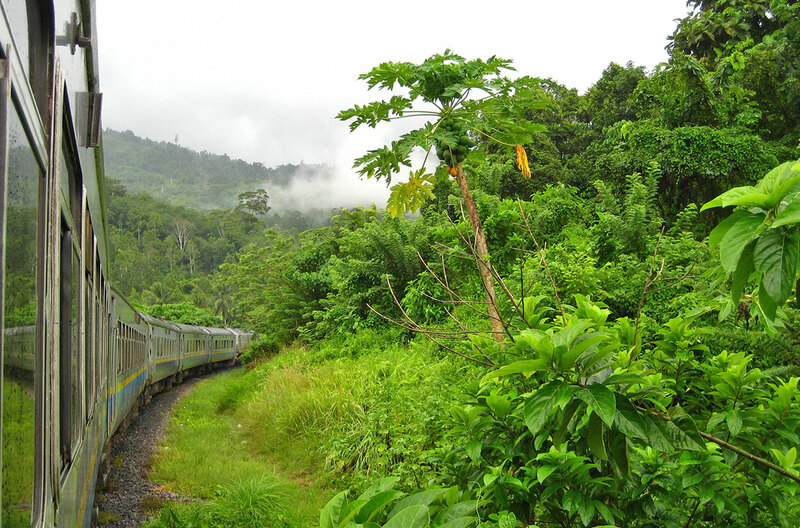 The East Coast Line is popularly known as the “Jungle Train” as it crosses the forests of central Malaysia. There is only one type of KTM Intercity train service in the present, Ekspres, which stops at all stations of the line. The Ekspres Rakyat Timuran comprised EKSPRES 26 service operating between Johor Bahru and Tumpat, offering seat and sleeper berth fares. The Ekspres Selatan comprises EKSPRES 40, 42, 44 services operating between Johor Bahru and Pulau Sebang / Tampin via Gemas, offering seat fares only. Outside Malaysia, KTM runs a Shuttle service between Johor Bahru and Singapore, called Shuttle Tebrau. The journey takes 5 minutes, connecting JB Sentral Railway Station in Johor Bahru with Woodlands CIQ facility in Singapore. Northbound passengers clear Singapore Immigration and Malaysian Immigration at Woodlands Train Checkpoint before boarding the train bound to Malaysia. Southbound passengers clear Malaysian Immigration at JB Sentral Railway Station and later Singapore Immigration after disembarking at Woodlands Train Checkpoint. Passengers travelling from Singapore to Kuala Lumpur must interchange at Johor Bahru from Shuttle Tebrau to Ekspres Selatan, then continue to Gemas to interchange from Ekspres Selatan to ETS. 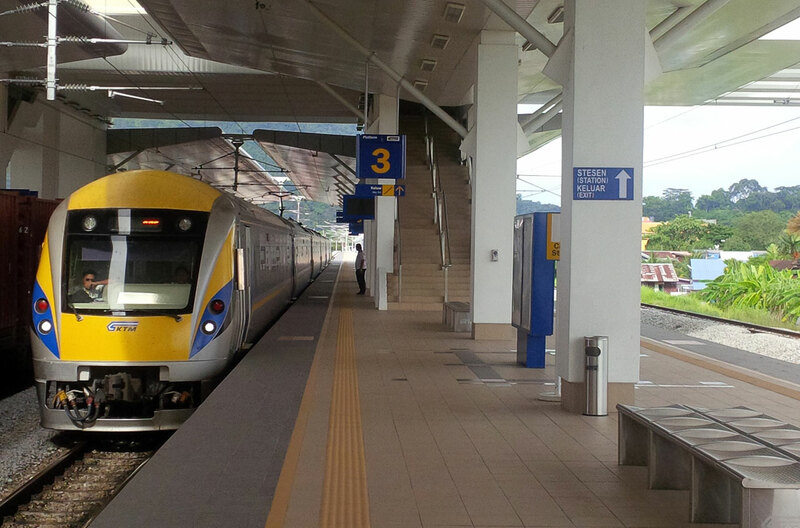 Passengers travelling from Kuala Lumpur to Singapore must interchange at Gemas from ETS to Ekspres Selatan, then continue to Johor Bahru to interchange from Ekspres Selatan to Shuttle Tebrau. 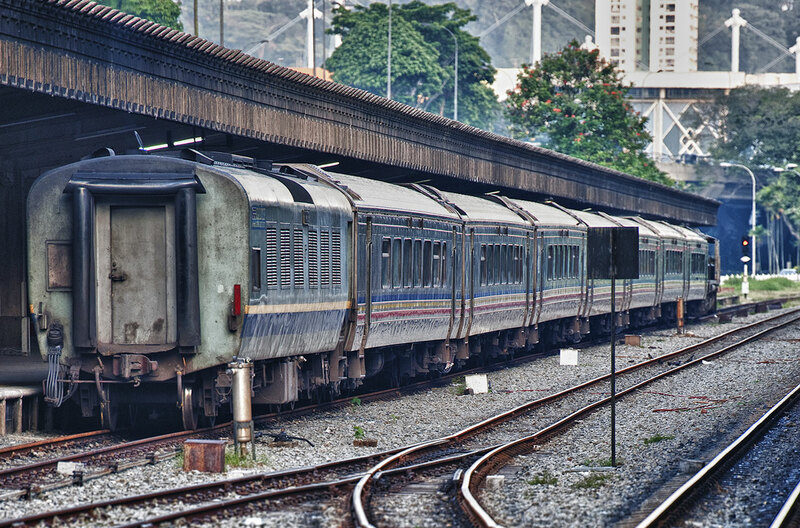 The Malaysian rail network is connected with the Thai railway network through Padang Besar, a border town located in the northern part of the state of Perlis, Malaysia territory. Padang Besar Railway Station has integrated customs and immigration facility for Malaysia and Thailand. 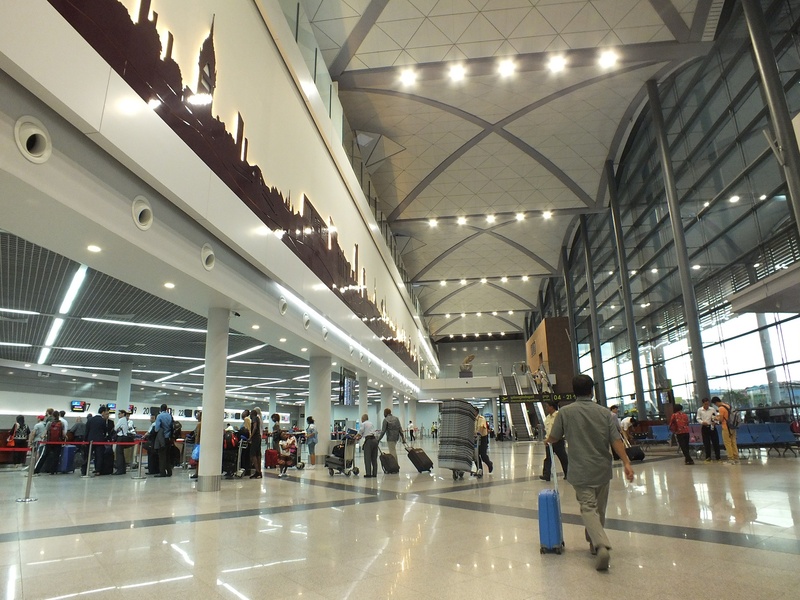 Northbound passengers are processed for exiting Malaysia and entering Thailand, and Southbound passengers are processed for exiting Thailand and entering Malaysia. 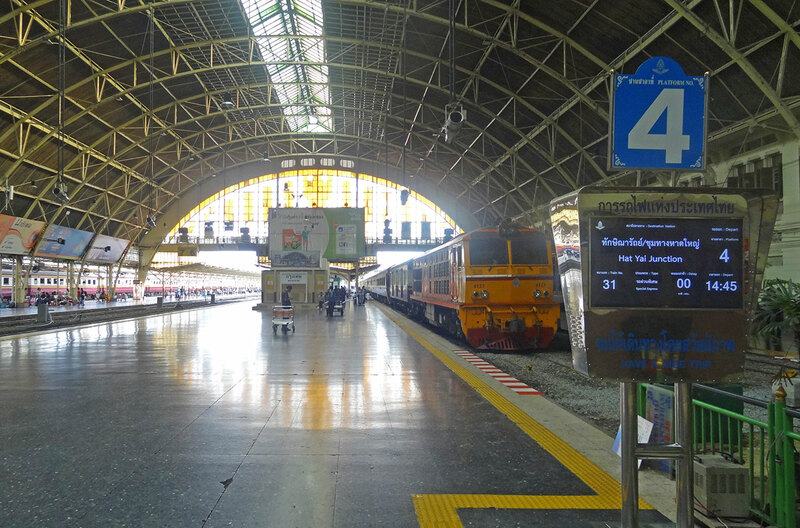 The Padang Besar station in Thailand only serves as a domestic station. Passengers travelling from Bangkok to Kuala Lumpur must interchange at Padang Besar from SRT SPECIAL EXPRESS 45 to KTM ETS. Passengers travelling from Kuala Lumpur to Bangkok must interchange at Padang Besar from KTM ETS to SRT SPECIAL EXPRESS 45, then continue all the way to Bangkok or reach Hat Yai Railway Station to interconnect with other SPECIAL and RAPID trains operated by State Railway of Thailand. Booking train tickets for KTM is very quick and simple. You can search your itinerary between any two cities in Peninsular Malaysia given your travel dates. 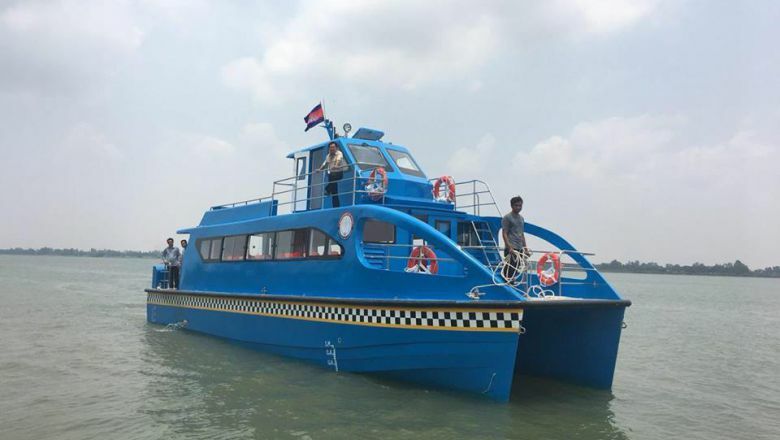 Our search engine will list the results available, which depending on the itinerary could be KTM ETS or KTM Intercity services. Compare the trains and select the most convenient schedule and price for you. Fill in the passenger form and select your seat. Next, you can complete the payment before submitting your booking request. Once your reservation is processed, you will receive an email with the booking confirmation and the electronic tickets attached.